This entry was posted on March 6, 2009 at 1:14 pm	and is filed under Maysa, Pictures. 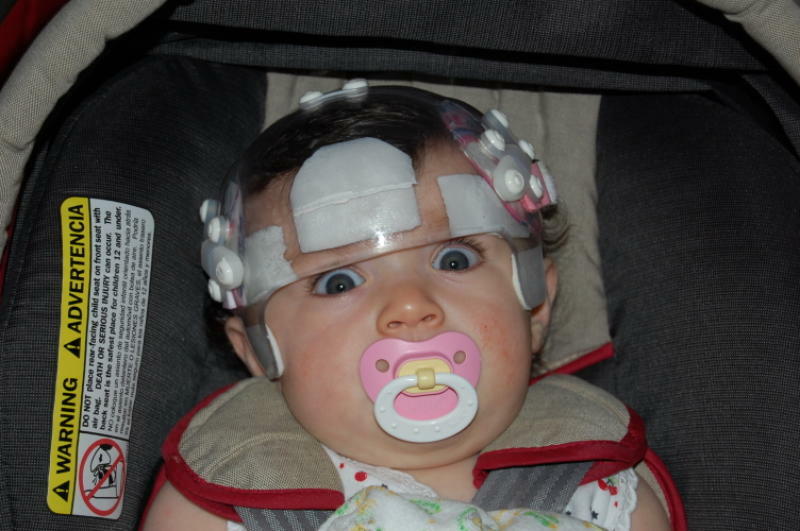 Tagged: 531, brachycephaly, passive helmet, plagiocephaly, Virginia. You can follow any responses to this entry through the RSS 2.0 feed. You can leave a response, or trackback from your own site. oh wow. i’m so happy you followed your instinct and switched bands. i can’t believe your little maysa will be graduating in two weeks! and with such amazing results!! we are looking at eight more weeks here. i know it’ll go by quickly, but, well—you know! anyway i just wanted to say thanks for riding this storm with me. without your advice and experience i fear we would have left alex in his ill-fitting band. i shudder to think of the damage it could have done. instead we are well on our way to a nice, round head. thank you. thank you! i hope you continue to be active in the plagio community helping more naive moms like me. you’re such a good advocate, a great blog buddy and an even better mommy! well done!! I admire YOU so much, you don’t even know. You are such a great mommy yourself, your boys don’t have a thing to worry about. I have a feeling little Alex will be out of his band before the 8 weeks time frame they’ve given you is over. He is bound to hit another big growth spurt soon and that’s all he needs to bring those few mm of plagio down to normal. It was hard seeing Maysa in her passive helmet in the summer time, but in your case, it will be all worth it. I hope to remain an active plagio member forever. This hurdle has affected me deeply and not only do I want to help and support the future plagio parents who will be joining, I also want people to be able to find out information about older kids with plagio/brachy (since Maysa will still have a bit of both left in her). Thanks for blogging about the shooting allens, besides my two little ones, they make my day everyday!